Curledup.com contributor Luan Gaines interviewed Elise Blackwell, author of The Unnatural History of Cypress Parish , who talked about inspiration from her grandfather, compromises made so that the next generation won't have to, and history's repetition across time. Interviewer Luan Gaines: The inspiration for The Unnatural History of Cypress Parish began with your grandfather’s memoir. Can you elaborate on this and how the novel grew from his memories? Elise Blackwell: Late in his life my grandfather sat down to write his memoirs as a gift to his children and grandchildren. This was the man who encouraged me to write as a child by paying me a dollar a story—until I grew too prolific, at which point he told me to keep writing but not for the money. I was fascinated by much of what I learned in his autobiography, particularly in the chapters about his childhood in rural Louisiana lumber camps. The seeds of the novel came from those chapters, though I hasten to add that the character of Louis Proby is not based on my grandfather—a man of far too much integrity to make an interesting fictional character. Louis’ father, William Proby, has kept his position in the logging community and increased his family’s fortunes over time. What kind of compromises has William made along the way? To William’s mind, he made compromises so that his children wouldn’t have to, so that his children would, as he puts it, “have the luxury of exercising a finer moral judgment than I could ever afford.” It’s a common American story, I think—one generation paving the road to social mobility for the next. William’s compromises included looking the other way in exchange for protection and betraying his own class interests. Ultimately he sacrifices a measure of his own integrity, which causes him, quite literally, to sag. He’s able to come back some, though, and I wish I had written more of his post-flood story. At seventeen, Louis is virtually a blank slate, his world defined by his upbringing. What is the significance of the incident at the beginning of the novel when Louis witnesses his father disarm one of the workers? What message does his father’s sudden violence send to Louis? I see that scene as the beginning of manhood for Louis. He sees the world as suddenly more dangerous—a place in which sudden and decisive action may be necessary. He takes away the idea that to be a man is to be self-protective. He’s also asked to lie and is able to justify the mistruth. Besides his father, Louis is impressed by the painter, Gaspar Anderson, and Charles Segrist, the businessman who asks the boy to be his driver. How does each man affect Louis’ development as a young man? That’s a key question to my understanding of the novel. To me, the tragedy of Louis’s youth is that he learns too little from Gaspar Anderson and too much from Charles Segrist. Charles introduces him to the city and its temptations (women in short skirts, men with economic power, champagne, jazz), which could be a wonderful thing, but Charles’s understanding of life is self-serving. He’s a man who believes that it’s not only fine but necessary to betray people you care about and even your own identity in order to succeed. Louis can count on Charles for fun when times are good, but he is mistaken to trust him beyond that. Gaspar teaches Louis more important lessons—lessons Louis will use more when he’s older but undervalues in youth. He teaches him that not everyone sees the world in the same way, which is something young people can overlook. He teaches him about perspective in every sense of the word. As his appreciation of the world expands through association with Charles Segrist, Louis sees the seedier side of life, introduced by Segrist in Crescent City to bootleggers Olivier Menard and Orlando Funes. What part do these men play in the grand scheme of things? The bootleggers are men with considerable local power and wealth, but they live at a time when the rural South was becoming more like the rest of the country and when regional differences (including power structures) were increasingly subordinated to larger forces. Menard and Funes hold considerable power at the novel’s opening—and Menard retains significant local power—but they are in some ways men of the past. Old feuds and ways of living are giving way to the more monolithic, less interesting power of money. It’s significant that the two former enemies wind up sort of on the same side of things as their parish is threatened from without. Also, their last names are significant to my reading of the novel, as well. I pulled the names from Borges to make a couple of points, including to draw attention to the structure of the novel (I like to argue that how the story is told is as important as the story itself) and to comment on the repetition of story across time-which is of course history. But I mean the men to work first and foremost as characters. How much of his family’s history does Louis accept at face value? Why does he later question the truth of the events he witnessed as a boy? Are the truths he discovers painful? I think that most children accept their parents’ word as truth and their lives as “normal.” Later, as we mature and experience other perspectives and ways of living, those beliefs fade. It’s also the case that southerners are great revisers of history, especially family history. It’s very hard to make sense of the past when it shifts and its telling changes. And it’s always painful to find out that the people we admired are flawed and that the world of our childhood more paltry than we thought it was. Although Louis realizes he will never again see his first love after the flood, he fails to take action and warn her of the impending disaster to Cypress Parish. Is Louis protecting his father? Louis makes his decision largely by default—a common sin. He does not consciously fail to warn Nanette or believe that she’s in danger. Where he goes wrong is in thinking that he’ll have another chance. When he discovers that her family has not merely evacuated but left for good, he realizes that he has lost his opportunity to make things right. It’s also the case, though, that he understands instinctively that he has already lost Nanette as his “love.” His role in her brother’s fate and their fathers’ complex animosity have polluted what he wanted to be a pure experience, a simple love. There’s some irony in the fact that the two fathers—in much the same way that Menard and Funes find themselves on the same side—become closer while Nanette is lost to Louis. In the same vein, what is Nanette Lancon’s significance in Louis’ young life and in his later years, when he considers the roads not taken? Nanette’s significance to young Louis is simple and overpowering: she is his first love, emotionally and sexually. Later, after the dynamiting of the levees, she represents his failure to understand human motivation. Louis is a young man who prides himself on observing and understanding the natural world, but he has a minimal and skewed understanding of why people (including himself) do what they do. Much later, in old age, Nanette represents just what you say: the possibility of other lives than the one he has led. Her brother also represents this in the novel, though in his case the alternative is a life yanked away rather than one not chosen. His future was changed by random fate in the same way the flood forever altered the lives of many people. Does a long interest in science shield Louis from the emotional events he experiences as a young man? Is it a coping mechanism or a manner of denial? Louis’s fascination with science begins simply, as a matter of observation and recording. It is later, after he gives more thought to perspective, that he uses it to seek deeper understanding. Though it is a filter, I don’t think science is either a coping mechanism or a form of denial. It is Louis’s arrogance that he “understands” the world that leads him to “miss the point,” particularly emotionally. The young Louis confuses description with deeper understanding; he may see and use this as a shield, but it doesn’t work. How does the fate of a burgeoning New Orleans effect the decision to dynamite Cypress Parish? What does this say about powerful men and the life-changing decisions they make? How does this event reflect the changing politics of Louisiana? Much of human history has resulted from decisions the powerful, particularly those with the power of wealth, make for everyone else. That was certainly true in 1927 Louisiana. Though Cypress Parish is a fictionalized setting, the novel is based on true events, including the dynamiting of levees south of New Orleans. That decision was made mostly by men who held no elected office, and it was made not so much to save the inhabitants of New Orleans (a teaming city, built largely below sea level, with little to offer in the way of evacuation routes) but to preserve the image that Northern capital was safe there. It’s an old story and a new one. Louis declares, “An old man may remember the facts of his youth, but he cannot always remember what they felt like.” What does this statement tell us about this character and his approach to life? Given the benefit of hindsight, what are his regrets? As I started to get at earlier, Louis, as a young man, overestimated his understanding of the world. Observing appearances and facts, he misunderstood his own experiences because he had only a shabby understanding of human motivation, even his own emotions. In one sense, he failed to experience his own youth. Though he has gone on to a successful life (materially and professionally), he is pervaded by regret. To some extent this is common—anyone thoughtful mourns missed opportunities—but it’s nearly defining for Louis, who understands the complexities of fluid mechanics and chaos theory but not his own life. He regrets most, I think, what he would admit was his betrayal of Gaspar and Nanette. The language throughout your novel is evocative, for example, how the odor of the sugar factory in Crescent City blends with that of the abattoir. Is Louis’ life is filled with other interesting parallels? How do such dichotomies keep Louis from taking action, or do they? That’s an interesting question, and, yes, I suppose certain dichotomies do hold Louis in suspension. He is held still between city and country, between art and science, between home and the wider world, between past and future. You finished The Unnatural History of Cypress Parish before Katrina struck. What were some of the complications you had to deal with in the wake of the devastating hurricane? Were you anxious about the acceptance of this novel because of Katrina? The novel was sitting unread on an editor’s desk the first time I heard the words hurricane and Katrina side-by-side. A couple of weeks later, after the hurricane had done its incredible damage, the novel still sat unread, and I was at a loss. Where before I had worried that the novel might seem too removed from contemporary experience, I now worried that it would seem opportunistic. The parallels between 1927 and 2005 are unsurprising to those of us from Louisiana, but they are staggering. In addition, one editor suggested that by the time the book would be published, people would have “Katrina fatigue” and not want to read about flooding in Louisiana. Ultimately, out of both necessity and choice, I set the novel aside for awhile and despaired of publishing it. During that time, I wrote another, very different novel: Grub , which comes out this fall. When I turned back to The Unnatural History of Cypress Parish , I realized that I didn’t want to just let it go, in part because of my familial and regional connections to the material. I knew I had to take some account of the recent tragedy since the novel references other more recent events, yet I did not want to write directly about Katrina for several reasons, both aesthetic and personal. My solution—which has been criticized by some reviewers outside of the region but appreciated by those who experienced Katrina—was to recast the story as a first-person narrative told on the eve of Katrina by a character now living far from New Orleans. I still view it as an imperfect solution, but I don’t think there was a perfect approach, and I’m glad that I got the novel into the world. The Great Flood of 1927 was historically significant for the region. Besides your grandfather’s memoir, were there other sources you used in researching the flood? My primary sources were my grandfather’s memoirs, Rising Tide by John Barry (which is a wonderful nonfiction account of the 1927 flood and its effects on the entire nation), family stories, and information gathered by some of the local historical societies in Louisiana and the Gillis W. Long Hansen’s Disease Treatment Center. What would you like readers to take away from The Unnatural History of Cypress Parish ? That’s a hard question! First and foremost, I want readers to enjoy the book, including at the level of language. And I hope that readers will come away with a deeper understanding than my narrator does. An interesting challenge in fiction—something I tried to do in this book and in my first novel, Hunger —is to let the reader draw different conclusions than the narrator does. That’s one reason I include “historical asides.” My hope is that readers draw connections between seemingly different situations. I don’t think the primary purpose of fiction is to teach lessons, but I do hope that readers will think about the way that history both is and isn’t varied across time. I also hope they will consider our various, incomplete ways of understanding the world. We need all of them: personal experience, historical fact, scientific observation and theory, artistic interpretation, family history, and so forth. Who are the authors that have most inspired your writing? Many, many authors, of course, including many long gone. More contemporary authors who have inspired me include Michael Ondaatje, W. G. Sebald, and Eudora Welty. Your previous novel, Hunger , was quite different from this one. Will your next novel be yet another departure? Can you share something about it with us? Grub , coming out this fall, is very different. It’s my longest to date (close to 400 pages), and it’s a funny book, meant to read quickly. A retelling of New Grub Street (George Gissing’s satire of the Victorian literary marketplace), it traces the triumphs and humiliations of a group of young writers living in contemporary New York. As a teacher at the University of South Carolina, how do you separate your writing from your teaching? Do your students want to discuss your work? A lot of what I have to teach stems from my writing, and I can bring to the classroom a sense of shared enterprise and offer insights into the writing process, solutions to various craft problems, and so forth. While I’ll discuss my process a bit, I ask my students not to read my work until after the course is over. I don’t want them to feel like they should imitate my style, and I enjoy reading a wide range of kinds of fiction. Besides there are better models out there! Most students respect that request, though of course many are curious. First, don’t write because you want to be “a writer” (whatever that is), but because you take pleasure (most of the time) in the writing itself. If you enjoy talking about writing more than you enjoy sitting alone in a room doing it, the effort may not be worth it for you. Second, read a lot and write a lot, and keep your eyes and mind open while you read and write. Third, think carefully and creatively about what kind of day job and life situation will best accommodate your writing over time. Fourth, be patient. Gymnasts may be past their prime at twenty, but you become a better writer across an entire life. Fifth, try to write something that matters—emotionally or intellectually or whatever it means to you. (Otherwise, why bother?) My advice isn’t particularly original, but it’s the best advice I can give. Elise Blackwell, is the author of Hunger , chosen as a Los Angeles Times Best Book of the year in 2003. Her short prose has appeared in Witness, Seed, Global City Review, Topic and other publications. Raised in southern Louisiana, she has also lived in Boise, Princeton, San Diego and other places in the U.S. She is currently on the English faculty at the University of South Carolina. 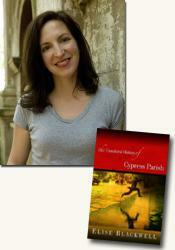 The Unnatural History of Cypress Parish is her second novel. Contributing reviewer Luan Gaines interviewed Elise Blackwell (see accompanying review), about her book for curledup.com. Luan Gaines/2007.